“My father found our new house”, my husband Abit told me as he came into our vintage textile shop one afternoon in late August 2005. Oh God, this was bound to be tough – what chance was there that Baba had selected a house that I would like? So far in the 6 years I’d known him, other than the gentlemanly way he dressed or the care he took to arrange carpets outside our shop, I’d not seen obvious signs of an esthetic eye. And since I knew we had to find a place in which my in-laws and some of my husband’s 9 siblings would also live, I was less than sure we’d find anything we’d all agree on quickly, if ever. Abit and I were tired of living in the ‘suburbs’ of Selcuk, in indistinctive beige concrete housing blocks so alike they were easy to become lost among. We wanted to find an old house somewhere closer to our business in the center of town. The problem was that we had to sell our entire 3-flat building to have the money to buy another home, with enough left over to free ourselves of debt from our business. So Abit and Baba walked the older neighborhoods of Selcuk, looking at houses and talking to everyone they knew about who was likely to sell. To me, the American foreigner, the idea that older single family homes, usually with charming original details and a private courtyard garden, were selling for less than a two-bedroom apartment stacked in anonymous rows of new buildings, was ridiculous. But fortunately that was true. 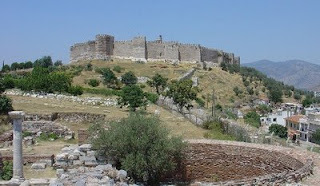 Ayasuluk Hill, with Selcuk’s Byzantine Fortress and the Tomb of St John in the foreground. Our house is to the right with the red tile roof. 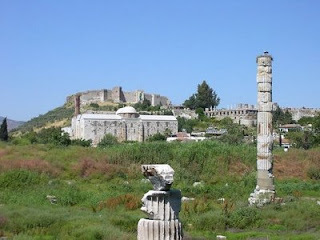 The central district of Selcuk is surrounded by the Isabey Mahallesi to the west, where the Byzantine fortress and the ruins of the 6thC Basilica of St John crown Ayasoluk Hill, with the 11thC Seljuk Isabey Mosque just below. 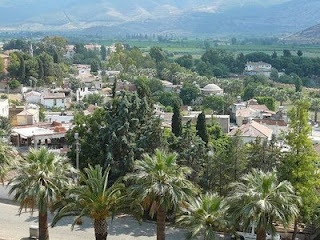 To the east of town is Zafer Mahallesi, which has lovely western views of the valley and the Aegean Sea beyond. But we’d spent part of a year in that neighborhood already, attempting to run a small pansiyon whose owner didn’t really want to give up control of her business. So that district, though lovely, was somewhat tainted in our minds. “C’mon, let me show you this place. I want to buy it today”, said Abit, half out the door. “My father has already been talking to the owner. As soon as other people find out we’re interested, we’ll have competitors and the price will go up”. As it turned out - yes. It would be hard for anyone to miss the fact the place was on the market, since the first thing I saw when we got within a block was a towering unpainted plaster building with “Satiliktir” - for sale - spray painted in huge black letters on two sides. “Hmmmm. Looks like a wreck…” I began. “No one has lived here for 6 years” Abit said. So, there would be a sudden rush to buy a place that’s been abandoned, and looked it?? Abit did not have a key to the garden iron double gate, so went around to the other side of the garden to hop the neighbor’s fence. Oh, great, a secure location, I thought. I had noticed as we had nearly run though the neighborhood below, up the hill to where the house stood, that the area was densely populated with large families in mostly old single family houses, interspersed with the newer concrete bunker-type apartments of our suburban mahalle, or neighborhood. But I was too intrigued with the Byzantine castle that loomed over the house to think about how close all the neighbors were, how there were so many people out on the street compared to our current 5022 Sokak (street) home. And how even more neighbors were coming out to see who was looking at the empty konak, the proper Turkish name for this type of traditional large house. Abit opened the gate from the inside, and I stepped into an overgrown garden, with the large house perched on the hill seemingly even bigger because we were 4 levels below the red tiled roof. Abit showed me across the weeds to a stone staircase on the opposite side, up to a small terrace level and finally up terrazzo stairs. I stopped dead in my tracks at the top of those stairs, and stared at my feet. Tile. If there is something decorative I love as much as textiles, it’s tile. And here were vintage, diagonally set encaustic tiles in quilt-like patterns of three quirky shades of tan, brown and cream, covering the expanse of the small terrace that led to double Ottoman style painted wood doors at the home’s entrance. 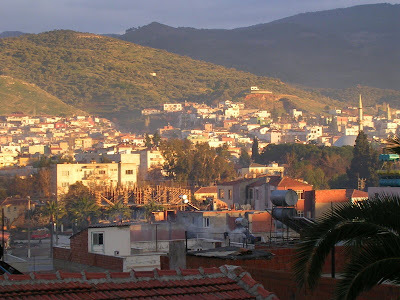 I turned to look back over the garden, and beyond to the eastern hills behind Selcuk. The sun was just going down, and the houses and hills were bathed in red- orange light. The garden’s several fruit trees and the neighbor’s large date palm, the tile roofs of the houses below – the scene was a Mediterranean dream, like being home in Santa Barbara’s Riviera hills. 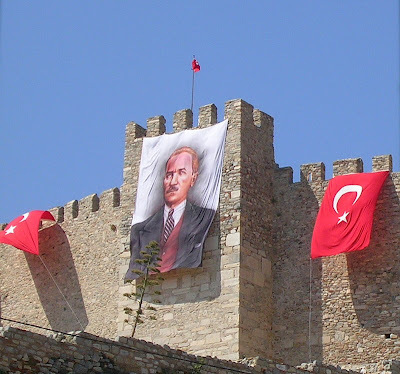 Even my “Goat Castle” – the next fortress in the chain that lined the Aegean coast and so named for an attack Ataturk’s troops had made there on the Greeks camouflaged in goatskins – was visible to the north on its’ high mountain pinnacle. Inside was much less of a dream. The massive meter thick walls meant the four rooms were tiny, at least by my Western standards. The central salon had a blocked-in window to the west so only the entrance doors let in any light. But the terrace tile covered this floor too! The two bedrooms off the salon had wood floors, and bizarre shades of pink, yellow and green paint, but the wood casement windows facing the Fortress were wide, and folded completely open, effectively removing half the walls. The owner had set metal window frames in the salon, ready to rip out the wooden casements and ‘modernize’ the place since it had not sold for 6 years. And I could see he was planning to rip out the floor tiles too, in favor of faux marble ceramic stacked in the corner. The bathroom had a tiny door off the kitchen hallway, but held the best tile of all. Four tiles together formed a repeat of brown and tan, a tropical forest of artichoke/thistle motifs that reminded me of Samarkand suzanis, or Matisse cutouts. And the kitchen had yet another pattern, this time Escher-like triangles of grey, black and cream. The kitchen looked straight out of the early last century, with stove hood in plaster in the corner, dish shelves running high around the walls, and no sign of modern day appliances. Two views of the sunny kitchen, cluttered but well used. We’ve added a modern stove where I’m sure a wood-burning one previously stood. Maybe I should have been horrified, but I was entranced. The castle hovered over us outside the bedroom windows, glowing now like a welcoming medieval lantern, as it would every night from dusk until dawn. What American romantic who had studied art history and had worked as an interior designer would not want to live in the shadow of a Byzantine fortress? 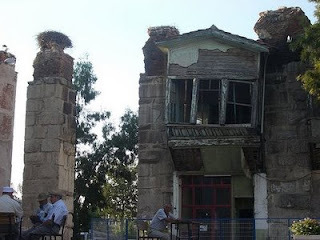 And in a house that was built from the rubble of the ruins of a basilica’s outer walls, on the same hill not 50 meters from where Emperor Justinian and Empress Theodora had built that massive cathedral over the tomb of St John the Evangelist? And with the added treasure of tile floors that would cost thousands of dollars to replicate, already worn to a glowing, slightly chipped patina by 70 plus years of pattering feet? Or course, we bought the house that week. I was not about to let anyone destroy that tile. Perhaps not the most rational way to make such a big decision, but I knew the bathroom floor tile alone would make me happy just to see it each morning. The entire house was painted while I was in the US that winter, in versions of the colors I wanted, though Abit overruled me and made the doors and window frames the traditional Aegean turquoise, to ‘protect’ the house. Though the workers got paint all over those tile floors, Abit was able to convince the family not to replace them as a “surprise” for me. Four summers later, we’ve not done much else to restore the actual house yet with so many people still living in it – there are 4 to 7 residents upstairs at the moment, counting one sister and her two children who stay here part-time. But the garden has thrived under Baba’s green thumb, with tomatoes, peppers, eggplants and squash under an orchard of fruit trees. Though we enter our floor from the garden and the family enters their second floor from the street level on the west side, privacy is still somewhat of a challenge. With thin wood floors that are strangely covered in wood grain printed wallpaper upstairs, it’s a bit like living with elephants overhead. We have a handmade ‘tandir’ in the lower garden, where Abit’s mother and his sisters convene every few days to bake bread. We’ve also had a goat in the lower garden, replaced by rabbits in a mud-walled, tile-roofed house that Baba took more care with than with any house for his 10 children. But now, only cats prowl the rows of veggies and flocks of sparrows inhabit the pomegranate, lemon, olive and mandarin trees. Above us under the Fortress, archeologists are currently digging to uncover a Bronze Age settlement recently discovered here on Ayasuluk Hill. Our Kurdish family is not impressed. They’ve lived among such antiquities all their lives and prefer the modern; they tell us they are not as happy here as they were in our previous modern apartment building. But this Californian loves living among the remains of the 8000 years of human civilization, even if the neighbors living here now are a little too close. Abit hopes to retire here someday and tend to the garden himself. And maybe buy a few surrounding houses to create a haven for writers and artists to stay, learn and be inspired by our Selcuk/Ephesus Valley. I hope to see that happen. The historic valley on Turkey's West Coast where we live has more than its share of diverse cultural attractions – from centuries of wonders at Ephesus, a city founded by a mythical tribe of women warriors known as Amazons, embellished by King Croesus, liberated by Alexander the Great and nearly as important as Rome, to the tomb of Jesus' favorite disciple and last home of the Virgin Mary, both sites of Christian pilgrimage, as well as a charming Ottoman village best known for its traditional pleasures of homemade wines and handmade lace. Nestled amid olive and pine tree-covered mountains, mandarin orange and peach groves, the roughly 12 square-mile Selçuk area's vast offerings are completed by a wide sandy beach alongthe blue Aegean Sea. Named for the pre-Ottoman Turks and pronounced "Sel-chuk", through millennia this region has been home to the Hittites, Carians, Lydians, Persians, as well as the Greeks, Romans, Byzantines and Turks. Each culture has left its mark on the people who live here now, though the handcrafts of the past are quickly becoming only marketing tools to attract tourists, as modern generations have few opportunities to make a living though the arts. 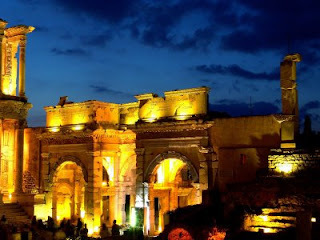 Or, they visit the last standing column and a half of the ancient Seven Wonder Temple of Artemis, built to honor the Artemis of Ephesus, the goddess combination of the Greek Artemis, goddess of the moon, the hunt and fertility, and the Anatolian mother goddess Kybele. This ancient temple, four times the size of the Parthenon in Athens, stood on the southwestern slope of Ayasuluk Hill. The Temple served as both religious institution and marketplace, visited by pilgrims, tourists and merchants from the far reaches of the known world, as long ago as 550BC. Ayasuluk Hill is also home to a Byzantine fortress, the 14th C Isa Bey Mosque, and the 6th C Basilica of St John, all above. 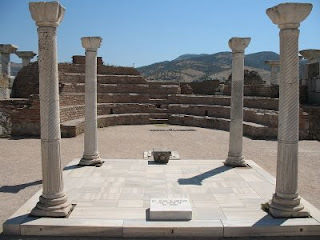 Travelers can also brandish replicas of gladiator's weapons at the Selçuk Ephesus Museum, sip cold mountain spring water from the well at the Virgin Mary's chapel, and wander the stony lanes in the hillside village of Sirince or our larger town of Selçuk, to mix with the locals and experience how people live here now. Selçuk is inhabited year-round by a pleasant mix of farmers and business people, tourists and travelers, and a growing expatriate community. The town is easily accessible by bus, train or car from big city Izmir's airport 37 miles north, or from the Aegean port town Kusadasi 12 miles south. All sites of interest are within walking distance from the town center or a short minibus ride away. Visitors stay in hospitable family-run hotels of antique-filled, traditional-style stone, or modern accommodations with sweeping roof terrace views. 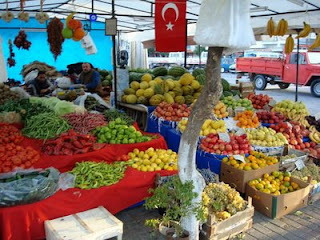 Restaurants serve savory home-cooked Turkish food and a farmer's market every Saturday abounds in fresh, locally grown produce. Tall stone Byzantine aqueducts bisect the town, supporting massive stork nests for the revered migratory birds, and propping up my favorite old Ottoman house, which in my ten years here has perpetually been on the verge of falling down. All centered on cobbled walking streets,making Selçuk the perfect travel base and a peaceful respite from the congested Aegean coastal towns. If this all sounds like a tourism pitch, I suppose it is. For you see, I have a dream for the future of sustainable tourism here, a dream that is shared by a few other small business owners - all women - who also work with local artisans. Our dream is reclaim our valley in the name of handcrafts. Yes, we have 'carpet villages', places where women demonstrate the art of weaving to busloads of captive tourists. 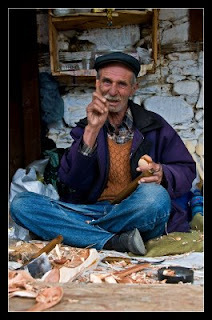 But how about staying in a small hillside neighborhood of winding lanes and old houses, with workshops where visitors spend a week learning how to shear a sheep, card wool, spin yarn, pick berries, roots and other materials to dye it, and develop the skill of tying a Turkish double knot? 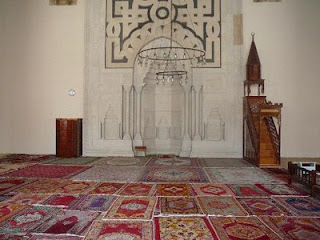 The Isa Bey Mosque, built in 1375 by the Anatolian Selçuk Turks from remnants of Ephesus and Basilica stone, is an asymmetrical mix of Selçuk and Ottoman architecture, with excellent carved decorations, a peaceful courtyard and lovely old prayer carpets for inspiration. Or, how about lace making classes? 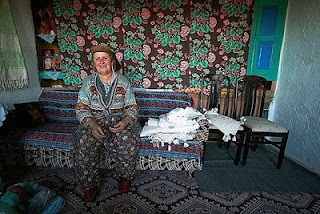 Plenty of Turkish women still make oya, the crocheted lace that traditionally edges headscarves and speaks a floral language that only other women of the same village can understand. Other regions of the world offer knitting tours – why not learn to make these colorful multi-patterned socks? Or the art of feltmaking, more of a southeastern Turkish art, but a practical one that uses every last fiber of wool after spinning and carpet weaving is done. 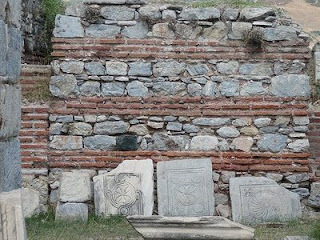 The sidewalks in Ephesus, where terraced courtyard houses were once occupied by the wealthy, are still complete with intricate mosaic floors and frescoed walls. Nowhere other than Pompeii do today's visitors have such an excellent chance to experience life in the ancient world. Selçuk surrounds Ayasuluk Hill, site of the first city of Ephesus, where artifacts dating to the Bronze Age of 6,000 BC have been uncovered. This is also the hill where we live, in a 70 year old stone house, just visible to the right with the red tile roof. With the wealth of antiquities here, few people live in houses as old of ours, a fact which I find ironic and also sad. The past is preserved only for tourists to visit, but why can't we live there as well? Why not recreate this ancient hill, now home to immigrants from the east and gentrifying big city Turks and foreigners? Let us reclaim these old houses and fill the lanes with artisans' workshops, creating jobs, training future generations and giving visitors hands-on experience in the ways things used to be made! Saint John the Evangelist, favorite of Jesus and only disciple to attend his crucifixion, with his important role in disseminating Christianity and writing the Book of Revelation, is buried on Ayasuluk Hill, according to several early Christian writers. In the 6th century AD, Emperor Justinian built an enormous Basilica over an earlier 4th C church. Many of the stone walls, strikingly contrasted by horizontal rows of red brick, still stand. From the terrace, there is a wonderful view of Selçuk, the Ephesian Plain and the Aegean, especially at sunset. Throughout the year, Selçuk holds festivals celebrating local culture. In January, camel wrestling is held near the beach. 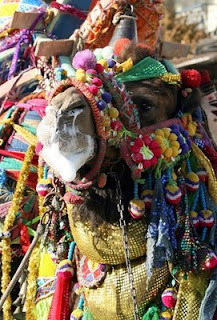 The traditional and colorful competition sports large beasts decorated in their finest kilims and tassels. While thousands of people come from all over to watch these beasts wrangle necks and kick up dust, it's far more fascinating for me to see what the camels will be wearing. 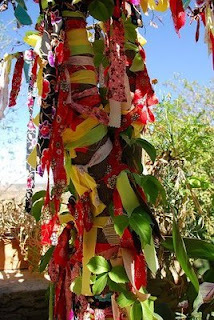 May and September host art, music, dance and handicraft festivals which are gaining more interest each year. But someday soon perhaps we shop owners of Selcuk will come together and request that Ayasuluk Hill be made an artists' district. Visitors could then come out from behind the glass windows of their big tourist buses and interact directly with the artisans – the carpet weavers, lace makers, copper workers, wood carvers, mosaic setters – and feel truly a part of the past here for a time, not just looking in as observers. Catherine Salter Bayar lives with her husband Abit in Selcuk, near Ephesus, Turkey, where they own a vintage textile shop and a water pipe & wine bar. 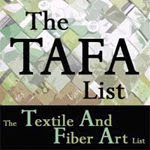 Catherine is currently working on a book on Turkish textiles, the carpet trade and life in a small Aegean town. The occupants of the cavernous room, with walls of hewn stone punctuated by arabesque carved doorways and filled with a soft light from above, are rapt with attention. Three men in flowing robes and large turbans watch while a barefoot carpet seller with a long beard works his best sales techniques on a fourth potential buyer, while the second, white-bearded carpet seller gauges the reaction of the group. The two sellers – one perhaps Persian, the other Afghan - gesture as they point out the unique qualities of a vast Heriz carpet, hanging from a balcony above the room and enormous in scale, even in the huge space. Other Persian and Turkish carpets are strewn around the floor behind the men in rejected heaps. Around the periphery of the room, several young men and boys watch and await instructions from the carpet sellers; the most attentive assistant is an African, perhaps a slave. A woman veiled in blue brazenly peeks from the corner doorway, ready to completely cover her face if the buyers, one of whom is a European wearing a dashing red coat, happen to glance her way. The question “Will the visitors buy?” tangibly pervades the scene. It’s possible that French artist Jean-Léon Gérôme accurately captured what a carpet shop was like more than 100 years ago, when he painted this Orientalist scene, The Carpet Merchant,while visiting the rug market in Cairo. The nostalgic setting this 1887 painting portrays, a mysterious market place full of colorful carpets from all along the Silk Road, with Egyptians, Turks, Persians and Europeans vying to purchase the best pieces, is still much what visitors to Turkey expect to find today.Though there are a few places in Turkey that replicate this exotic environment, buying carpets to resell these days is not that experience, though this painting appears on countless carpet shop walls, even ours. Perhaps because we trade in weavings from the past, we’d like to recall those days, however romantically portrayed, in which such magnificent, authentic carpets were highly sought after by every visitor to our region. I’d never seen The Carpet Merchant before I moved to Turkey, though the idea of wading through deep piles of those vibrant rugs in alabaster rooms greatly appealed to my sensuous nature. At least I didn’t have to be that woman peering from the doorway, excluded from participating in the business proceedings. Or so I thought when Abit and I first started buying for our shop in the Western Turkish town of Selcuk in 1999. No novice to textile commerce worldwide, I was not surprised to find myself once again in a business completely dominated by men. Those in power in the carpet trade here, at least the traders with whom Abit, my husband, had developed the essential relationships, were very traditional, very powerful men with origins in Van, a region in Eastern Turkey, on the Iranian border. These men were not the chic, European-educated business owners I worked with when I first visited Istanbul in the early 1990’s. Dealing with those men – whose offices and factories were almost completely run by extremely bright and well organized Turkish women – gave me a favorable impression of Turkey as a modern place to work. 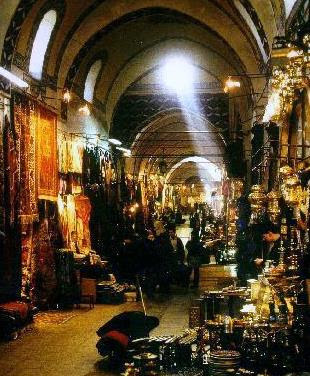 But I’d also shopped the Grand Bazaar and surrounding lanes on my own during my early trips enough to have discerned that carpet dealers were not cut from the same progressive cloth.During our first season of purchasing in the Turkish carpet trade, I immediately realized that the exotic stroll through an ancient marketplace my romantic mind’s eye pictured had little basis in reality. 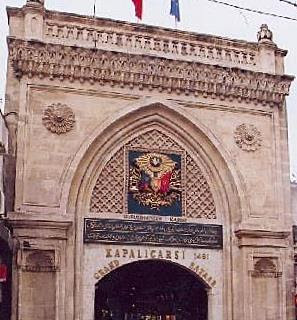 Visits to the wholesalers we used when we first started our business were in the old quarters of Nuruosmaniye within the walls of Istanbul’s old city near the Grand Bazaar (with one palatial entrance to this enormous complex pictured above), or along the cramped narrow lanes of Kemeralti in Izmir. These districts have a certain seedy charm, with their greyed, unpainted wood exteriors concealing vast warehouses of colorful carpets within. And like the painting, the men we visited were eager to fill our shop with their wares, spending hours unfolding kilims and unrolling carpets to convince us that they had the finest rugs on offer. But other than our dealings also being among people from several ethnic groups – Kurds, Turkmen, Uzbeks, and me, the solo ethnic European - the resemblance to the painting ended there.Upon a first visit to a wholesaler, I might be completely ignored after the initial greeting, and sometimes even then. Just like my clothing industry visits to China and other countries in the Far East, I could not possibly be the person in charge of finances, so was of no importance, until the surprised men discovered otherwise. We drank endless glasses of tea while the men chain smoked cigarettes. Obviously, business dealings required constant supplies of nicotine, no matter what harm all that smoke may do to the fibers. Abit (center in the photo above) and I would select the pieces we wanted. The men were clearly intrigued and sometimes quite mystified that Abit would consult me at all about what I liked. Though he had explained my textile background and ability to know quality when I saw it, the men were not at all convinced that I, a foreign woman, had any idea what I was doing. As the meetings went on though, sometimes for hours late into the night or even several meetings over days, the men grudgingly began to understand that I knew what I was doing. Not that this was stated, and in those early days my Turkish was not sufficient to know what they were saying. And the men were also speaking Kurdish in their negotiations, since that was most often the mother tongue to everyone in the room but me. Nonetheless, I understood the looks of admiration I eventually got from some of the dealers, and Abit was told more than once how lucky he was. I was sure however they were convinced Abit had caught a wealthy American fish and they were eager to reel in as much of our cash as they could. 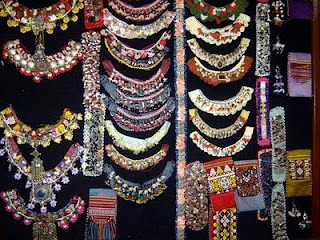 In the early years of our business, the semi-annual visit to the wholesalers was still a treasure hunt, with dealers emptying never-ending black bags crammed with perfect suzanis, or leading us through rooms stacked to the high ceilings with old rugs from all over the Near East. Today, buying merchandise from these same dealers would be like going to Pasadena’s Sunday Rose Bowl flea market on a mission to find the genuine vintage handmade textile buried under heaps of machine-made odds and ends. In the decade since we started our business, wholesalers have become merchants of newly woven goods. In traditional Turkish patterns, yes, though they are imported from countries such as Pakistan, Nepal or China. Working with only a few main wholesalers, each specializing in different regions, therefore differing types of textiles, was logical for 1999. In the barter system used here, the more we bought, in “American cash dollars”, the phrase always used, the better the wholesale prices got. Ten years ago, that meant that we could buy a wonderful assortment of vintage rugs – those kilims and carpets woven decades before as dowry pieces with no concern for what a Westerner would buy, with nothing newly made, and all of it woven in Turkey or Central Asia – for amounts of money that seemed very reasonable to me. Now, in 2009, it would be impossible to buy the same goods for three times the price, if you could find them here at all. Thankfully, we bought so much when prices were good that we have some of those original purchases in stock. Selcuk does not often get buyers who are looking for collectors’ pieces; frustrating for income but fine in the long run since these vintage rugs do not lose, but increase, in value if they are well taken care of. Investing in dowry kilims and carpets in the late 1990’s turned out to be a wise decision, since they are truly a vanishing market in Turkey. These days, we buy very few pieces, and only from trusted older men who scour the villages looking for rugs no one wants any longer. Like all things vintage, once these weavings are sold, we will be looking for a new business. Our former shop in Selcuk, with most of the carpets and kilims kept insidethese days to protect them from the hot summer sun.The minaret behind to the left is the oldest in town, from the 14th Century Seljuk Empire.One stork is just visible on top – Selcuk’s high places hostenormous nests where the storks live from May to October. Next post: Though a brotherhood of wholesalers and sellers control the carpet trade in Turkey, it is a sisterhood of weavers that is very much affected by this weaving art in transition.